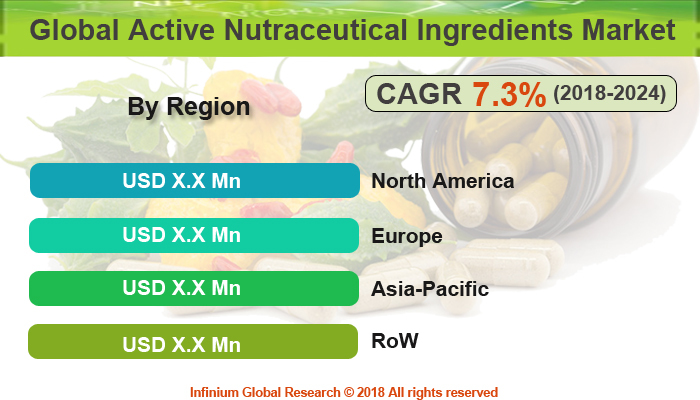 A recent report published by Infinium Global Research on active nutraceuticals ingredients markets provides an in-depth analysis of segments and sub-segments in global as well as regional active nutraceuticals ingredients markets. The study also highlights the impact of drivers, restraints and macro indicators on the global and regional active nutraceuticals ingredients markets over the short term as well as long term. The report is a comprehensive presentation of trends, forecast and dollar values of global active nutraceuticals ingredients markets. According to the report the global active nutraceuticals ingredients markets is projected to grow at a CAGR of 7.3% over the forecast period of 2018-2024. Active nutraceuticals are products that provide protection against chronic disease as well as provides physiological benefit. Active nutraceuticals are used to improve health, delay the aging process, prevent chronic diseases, increase life expectancy, and support the structure or function of the body. The active nutraceutical ingredients can be consumed through various foods such as dietary supplements, functional foods, and functional beverages. The major application of nutraceutical ingredients is seen in dietary supplements segment. Many factors are helping to boost this market, such as increasing health awareness among people, increasing demand for healthy food, growing aging population who want to remain active and fit for day to day work, memory enhancement, joint strengthening, growing trends of wellbeing and vitality among the youth population. In addition, customization of active nutraceuticals as per different requirements of the different age group of people is also one of the key factor supporting the market growth. Furthermore, many companies are focusing on developing a different variety of active nutraceuticals in order to improve the market growth. North America dominates the global Active nutraceuticals market. Asia-Pacific region is expected to grow at the highest CAGR during the forecast period of 2018-2024 due to growing number of health-conscious young people, shifting trend from taking vitamin supplements to meet the RDA nutrition towards overall improvement of health, increasing self-medication among consumers, easily availability of these product through traditional and online medical stores, increasing disposable income among people in these regions etc. are influencing the market growth rate in Asia-Pacific region. The report on global active nutraceuticals ingredients markets covers segments such as type, application, form and health benefit. On the basis of type the global active nutraceuticals ingredients markets is categorized into prebiotics, probiotics, proteins & amino acids, omega-3 fatty acids, minerals, vitamins, carotenoids, fibers & specialty carbohydrates and phytochemical & plant extracts. On the basis of application the global active nutraceuticals ingredients markets is categorized into a functional food, functional beverages, dietary supplements, animal nutrition, and personal care. On the basis of form the global active nutraceuticals ingredients markets is categorized into dry and liquid. On the basis of health benefit the global active nutraceuticals ingredients markets is categorized into gut health, heart health, bone health, immunity, nutrition, weight management, and others. The report provides profiles of the companies in the global active nutraceuticals ingredients markets such as Cargill, DowDuPont, BASF, ADM, Associated British Foods, DSM, Ingredion, Arla Foods, Tate & Lyle and Ajinomoto. The report provides deep insights on demand forecasts, market trends, and micro and macro indicators. In addition, this report provides insights into the factors that are driving and restraining the global active nutraceuticals ingredients markets. Moreover, IGR-Growth Matrix analysis given in the report brings insight into the investment areas that existing or new market players can consider. The report provides insights into the market using analytical tools such as Porter's five forces analysis and DRO analysis of active nutraceuticals ingredients markets. Moreover, the study highlights current market trends and provides forecast from 2018-2024. We also have highlighted future trends in the active nutraceuticals ingredients markets that will impact the demand during the forecast period. Moreover, the competitive analysis given in each regional market brings insight into the market share of the leading players. This report will help manufacturers, suppliers, and distributors of the active nutraceuticals ingredients markets to understand the present and future trends in this market and formulate their strategies accordingly.